My husband and I like the bitter gourd Fries. 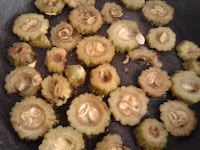 Bitter gourd was one such vegetable that I hated as a kid and slowly started to like the fried bitter gourds after marriage. We love to have it on rainy seasons and that was the reason for me to get the bitter gourd from the market. But unfortunately we both fell sick and I wanted to avoid the fried items but I had bitter gourds in my fridge and I had to use it. I tried to find out bitter gourd dishes but I was interested in none of them. Finally, decideD to make bitter gourd pickle that goes well with rice soup/paej. Bitter Gourd Pickle/Karathe Kudko has a spicy coating and that tempted me the most as I love spicy food. 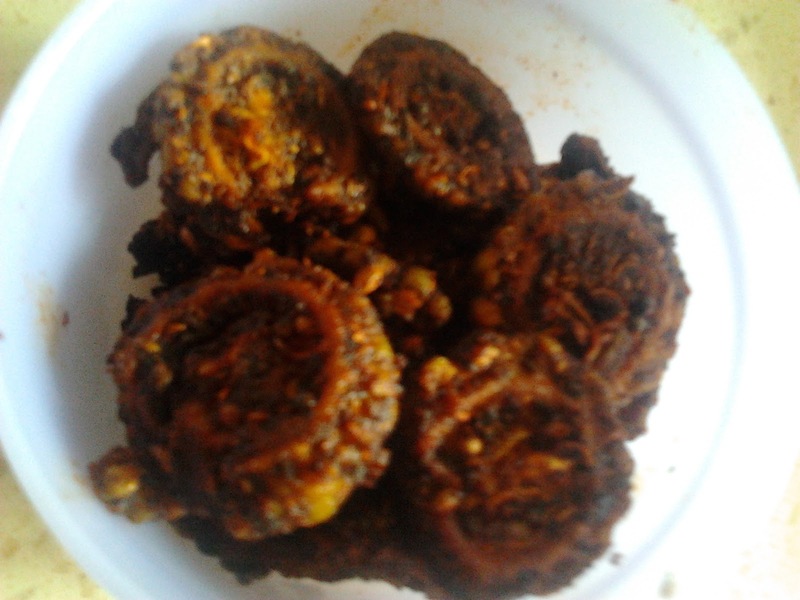 This dish turned out to be so tasty and mind blowing that now I prefer this instead of bitter gourd fries. You too try this and experience the spicy and sour taste of it. You have to taste it atleast once and the other advantage of this dish is it can be stored for weeks in an airtight container. Bitter Gourd pieces are mixed with salt and kept for 30 minutes to reduce the bitterness of it. Bitter Gourd is a very healthy vegetable and helps to lower the blood sugar levels, improves blood circulation and helps to prevent hypertension. Tamarind water is made by soaking tamarind in a cup of water until soft. Squeeze the pulp repeatedly with your fingers to dissolve it. Discard the fibrous material and just use the thick liquid. Wash bitter gourd and chop it in circles. Add salt to it and keep it for 30 minutes. 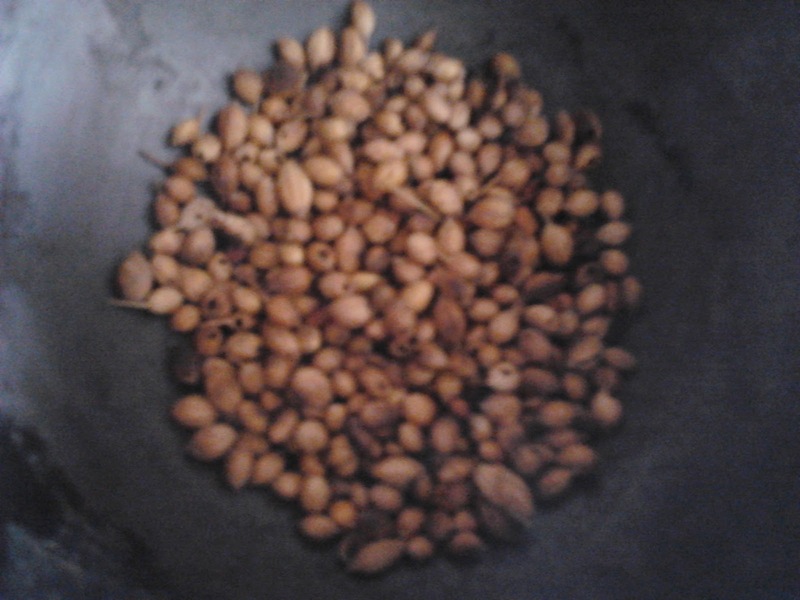 Dry roast the coriander seeds and fenugreek seeds until light brown and make a fine powder of it in a mixer. In a pan add tamarind water, chopped bitter gourds,turmeric powder and salt if needed (remember that you have added salt with bitter gourds before). Allow bitter gourds to boil by closing lid on low flame. Turn the bitter gourds on other side after one side is boiled so as to absorb the tamarind water. Boil until the water is completely evaporated and bitter gourds are dry. Heat oil in a pan. Add mustard seeds and curry leaves. Wait until mastard seeds pop up. Add the fine powder, asafoetida and red chilly powder and saute for 1 minute. Now add the boiled bitter gourd and mix well until the bitter gourd is coated with the spices. Switch off the flame and store it in an closed/air-tight container for future use. Serve with paej/rice soup or plain rice. Enjoyed reading it and my mouth was watering through out. Thanks for sharing, but have you ever tried South Indian Andhra Style Bitter Gourd pickle achar or kakarakaya pickle , and various andhra pickles by SITARA at their online store then it's a totally different scenario health and taste combination.